← The Cerberus is Loose! Below, you’ll find Chapter 1 of The Cerberus Rebellion. I hope you enjoy! The day was cool and dry but a stiff wind heralded a storm. Cold; the kind that would ride over the northern mountains from the tundra beyond and blanket the city of Aetheston in snow. His Grace Eadric Garrard, King of Ansgar and Duke of Elsdon, was deep in thought as he read a large, leather bound book. He was taller than most, and broader too, with a full head of chestnut hair and vivid green eyes. He wore loose green trousers and a white cotton shirt, buttoned three-quarters of the way to his throat. The wind howled outside the thick window. The study was small, meant only for the king and a single guest. A long desk cut the room in two; on one side, the King’s massive leather chair, a smaller on the other. Book-lined shelves were built into two of the thick black stone walls from floor to low ceiling and a pair of lanterns flanked the oak door on the third wall. Behind the King, a stained-glass window stood in for the fourth wall. The room was near the top of Old Keep and faced north; sunlight filled the room from sunrise to sunset. The tome was the abbreviated history of every king of Ansgar. Robert the Unifier, the Thirty-Fourth King of Ansgar, ascended to the throne one thousand, one hundred and fifty-nine years after the founding of Aetheston, at the age of thirty-four years, Eadric read. The book had been printed, not handwritten, so it was easier to read than most of the ancient tomes in his study. Robert was so named after he married Helena of Agilard, the first daughter of the first Duke of Agilard, the Last King of Kerberos having died thirteen years earlier. Robert dedicated his reign to bringing peace and stability to the conquered lands of Kerberos. Robert fathered three sons and two daughters that survived to adulthood, including Charles, his heir. The study door groaned open and Eadric looked up. It was his steward; the only person allowed to enter without permission. The man’s leather shoes scuffed at the stone floor as he shuffled across the room toward the King’s table. The man was short, stout and bald. He wore a simple green robe and carried a silver carafe, a cup, a dome covered plate and a folded newspaper on a tray. He set the tray on the desk and lifted the dome. Steam rose from the plate beneath; the bacon still crackled, there was some sizzle left to the small strips of steak, and scrambled eggs covered the rest of the plate. Eadric looked the tray over. “Has it been tasted?” he asked. He saw the chunk of steak that had been cut at one end of the thick strip, and a piece of bacon half as long as the others. “Yes, My King,” the steward confirmed. “You may go,” Eadric said curtly. The steward nodded and turned. Eadric waited for the door to close behind the man, then sighed. He pulled open the small drawer at the top of his desk, reached inside, and retrieved a small round tin. He twisted the lid off the tin with practiced ease and sniffed at the black and red powder within. Satisfied that it had not been tampered with, Eadric took a heavy pinch and sprinkled the powder across the plate, careful to get every part of the meal but waste none. Another heavy pinch went into the carafe of coffee. Eadric spent a small fortune every year to keep himself supplied with Dragonsalt. The powder was ground from the seeds of the Dragonleaf plant, which only grew in high mountain caves and passes. Each flower only produced enough seed for a pinch of salt and each plant only flowered twice a year. By itself, the powder had a bitter taste to it, but when it was mixed with anything else it had no taste at all. It had taken years of practice and experience to find the right amount: too much and his stomach burned for days, too little and it would have no effect on the poisons that it was meant to counter. He didn’t know if he’d ever been saved by the salt, but he wasn’t about to go without it. Every meal that the King ate was prepared and escorted to him under the watchful eyes of his guards, but even with all of those precautions, Eadric knew that poisons could make their way into his meals. Eadric poured himself a cup of coffee. The cup was made from the talon of a particularly large griffin; another method of warding off poisons. He sipped the coffee then lifted a piece of bacon and took a furtive bite; it was still floppy, the way that he liked it. The Dragonsalt had dissolved enough that all he tasted was the grease and black pepper seasoning and pork. He nodded in satisfaction to no one in particular and unfolded the newspaper. A fist banged on the door. “Enter,” Eadric called, his voice thick with irritation. The door swung open again and his captain of guards stepped through it. Kendall Shield was a broad shouldered man with a strong jaw, cold gray eyes and coal black hair. He wore a green, double-breasted frock-coat with a double row of golden buttons down the front and green trousers. Over his heart was the sigil of House Garrard: a golden man with a spear in hand, set on a white and green checked field. Above it was a smaller symbol: a plain brown shield with a golden crown in the center. Eadric could see the handle and pommel of Kendall’s greatsword Guardian over his shoulder. Kendall was the perfect fit for the gargantuan weapon: he stood more than seven feet tall. The blade was hereditary, as was the title of Lord of Shields and Protector of the King. The Shield clan had once been called something else, but whatever that name had been, it had been lost to history twelve hundred years earlier when they had sworn themselves and their descendants to the protection of the King of Ansgar. From the twelve men that had sworn their service, a clan had emerged that now included more than twelve hundred men-at-arms. And chief among them was Kendall Shield. He was called Lord, but he held no lands; only the right to be the personal guard to the king. A much smaller man stepped through the door behind Kendall. He was olive skinned and of average height, his brown hair damp with sweat from climbing the winding tower steps. He wore a blue sack suit with the symbol of the nation of Welos sewn over his heart. He kept his green eyes focused at Eadric’s feet. A mere messenger. Eadric stood to greet his visitor. “Your Grace.” Kendall went to one knee; the man behind him followed suit. “Your Grace, I bring a request from Lord Wyne,” the messenger announced. “Considering your attire, I wouldn’t have expected it to be from anyone else,” Eadric said and snorted. Eadric’s eyes narrowed. While it was not uncommon for the ambassadors from other lands to request audiences with him, they usually did so while he held court, or through one of his council members. “Yes, Your Grace.” The messenger bowed and backed out of the study; Kendall stayed. “Have my steward prepare my parlor for visitors,” Eadric said. Eadric drained his cup with a single drink, picked up the newspaper, folded it and turned for the door. Kendall waited outside with his arms folded. A guard stood on either side of the door; they stiffened when the King stepped through the doorway. Both guards wore green frock-coats with a single row of buttons down the center, green trousers, and, unlike their commander, carried rifled muskets and had holstered revolvers on their right hips. The weapons rested on the stone floor and the guards held them near the end of the barrels. At the end of the hall, a young squire shot upright and hurried to the King’s side. He was small even for twelve, with short black hair and green eyes. The boy was the son of one of Eadric’s more important lesser lords, though the King always had trouble remembering which. “I need to prepare for my visitors,” Eadric announced. “Yes, Your Grace.” Kendall nodded. 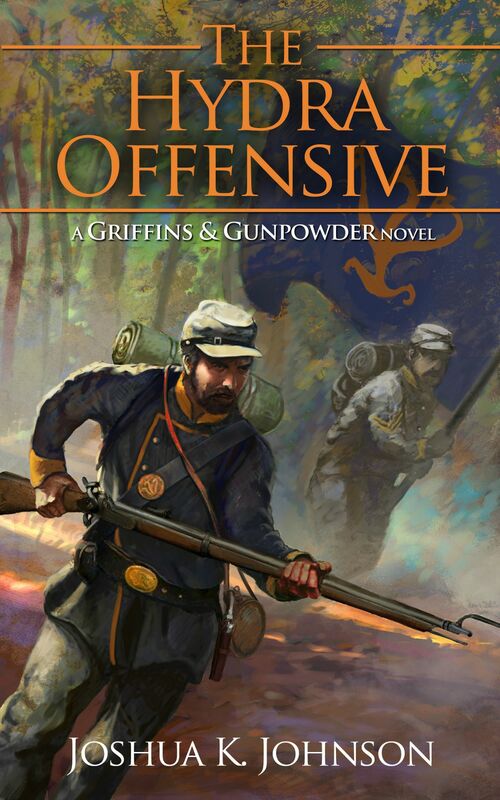 Landon and Radnor shouldered their rifled muskets and the five of them started down the passage. The Old Keep was a tall, round structure with wide stairs along the inside of the thick walls. Kendall led the way down the winding stairwell. Eadric was a handful of steps behind him with his squire on his heels, Landon and Radnor another few steps further still behind. Servants and pages pressed themselves against the wall of the stairwell as the King passed, their heads bowed to their sovereign as he made his way toward the bottom of the tower. Kendall stopped and held up his hand. The screeching laughter of a child washed over the party as Crown Prince Tyler barreled up the steps, his sister Kara close on his heels. Behind the girl were the children’s guards. The four men breathed heavily as they worked to keep up with the children. The boy was near his eighth year and was already the spitting image of his father: the same brown hair, green eyes and square jaw as his sire, and he was nearly as tall as his sister. She was eleven, with their mother’s chestnut hair and blue eyes. “Your Grace.” Sir Vance Shield led the guards assigned to the Crown Prince. He was Kendall’s half brother. The former Lord Protector had remarried after his first wife had passed away in childbirth. Where the first Lady Shield had been a woman of Kerberos, tall and broad of shoulders, the second was a native of Ansgar’s central region. Tonya Shield was barely five feet tall, with auburn hair and green eyes. Vance had inherited his mother’s hair and was nowhere near as tall as his older half-brother. He barely surpassed six feet. He had the same coal gray eyes, though, and his arms were as broad as a smaller man’s legs. An Elvish broadsword hung from his left hip in an ornate scabbard. Not as impressive as Guardian but a symbol of his status nonetheless. The other guards carried rifled muskets. They all had the same plain look as most of the Shield clan: they were shorter than Kendall with dark hair and dark eyes. Eadric inclined his head in greeting. “Papa,” Tyler said as he wrapped his arms around his father’s leg. “What is it, son?” Eadric asked as he mussed his son’s hair. “Are there any great creatures left, Father?” Kara asked. The children gave him quick hugs, then continued their screaming run up the tower steps. Their guards tried to keep up. At the base of the Old Keep, outside of the King’s Chambers, two men stood guard that Eadric had never seen before. They wore the uniforms of his guard, and even had the look of first branch Shields. They were tall and massive, with dark hair and wide brown eyes, but he didn’t know them and didn’t know that Kendall had made a change in his protection. The men inclined their heads as the king strode by them wordlessly into his chambers. His squire and Kendall followed him. Eadric didn’t have to ask if the men were trained. Kendall wouldn’t bring anyone into consideration for the King’s protection if he wasn’t sure of their abilities. Nonetheless, Eadric was hesitant. He disliked change in the group assigned to protect him. The men that served him were a critical part of Eadric’s day-to-day existence, a part on which he relied heavily. If he didn’t feel comfortable with those who protected him, how would he feel safe? At nearly five years younger than Eadric, the King had watched Kendall grow up. Eadric had known that the man would become his Lord Protector from the day he knew what a Lord Protector was. He had treated Kendall with more respect than he treated anyone outside his own family. The lesser branches and older of the first branch of the King’s Shields were generally assigned to protect those lower in the line of succession to the throne. While Katherine had once been the eldest child of King Charles, she was now further in line of succession, after Eadric’s son and daughter and his nephews. Sometime later, Eadric finished the last of another glass of whiskey. A half melted ice cube was left alone in the small glass. Even during the winter, ice was an expensive rarity shipped down from the north in massive chunks, but if anyone in Ansgar could afford the luxury of a cool drink, it was the king. He nodded to his steward, tucked neatly into a corner away from the King and his guests. The man disappeared through the huge door and closed it behind him. Eadric had taken off his tailcoat, though he still wore his crown on his brown hair. The white wool shirt that Eadric wore was large, even for his well muscled body, and green wool trousers were cut loose enough to provide plenty of circulation. Eadric had decided to meet with his current guests in his parlor, a small room far from the noise and activity of the throne room or the council chambers, because all of the rooms beneath the castle had been built with the magic of ancient Elvish wizards. The Elves had cast powerful incantations on the thick black stones so that they were always temperate to the touch. Tiny gemstone flecks in the stones sparkled in the lantern light. Eadric stood at the only real table in the room, pushed against the back wall of the parlor. A grand map of the world was laid across the massive surface, each nation intricately drawn and painted on what Eadric supposed was an old leather hide. A box of markers was tucked beneath the table, used when troop movements and activities were discussed. Those markers were worn down from their once grand carving, the black stone smoothed from more than a thousand years of handling by kings, generals and advisors beyond Eadric’s count. The nation of Ansgar occupied the entire southern half of the continent and stretched more than fourteen thousand miles from Agilard in the east to the West Shore at the other end of the continent. In the west, the territories loyal to him reached from the Griffin Coast on the northern shore, nearly four thousand miles to Sea Watch Castle as it faced the south on the Vast Sea. His nation was the most narrow at the Tirrell Barony, only a few hundred miles from the coast to the nation’s border with Franta. Ansgar was home to more than seventy-five million citizens, and Eadric was their king. The parlor had once been a dark, empty place. When he had been crowned, Eadric had ordered tapestries hung to celebrate his family’s many accomplishments in the twelve hundred years that they had ruled Ansgar. One of the massive hangings depicted his great-grandfather’s victory over the Last King of Kerberos, the banner of his house raised above the red three-headed hellhound against black of Agilard. Another tapestry was a scene from much further back in the history of Ansgar: the first landing of settlers after the long and perilous journey from Welos. Kendall stood in a small alcove near the door. His arms were crossed and his eyes watched the king’s guests with a flicker of suspicion in his eyes. He did not concern himself with matters of foreign relations, but the law stated that when the King received guests, the Lord Protector was to be present. He wore a gun-belt with a pair of revolvers holstered on his thighs; their grips were made of ivory and their barrels were iron. Four over-sized dark red leather chairs were arranged in a rough circle in the center of the small room to allow for conversation. Each had a small, dark wood table beside it to hold drinks or a small plate. The floor was bare stone. Each of the two guests occupied one of the large chairs. Both held a glass similar to Eadric’s, though they remained on their first while Eadric was on his third. They had brought him heavy news and a grand request, but seemed to be at peace with the words that they carried. Lord Thomas Wyne, ambassador to the nation of Welos, sat nearest the door. He was much smaller than Eadric, with short brown hair well salted with gray and dull brown eyes. He had the look of a career diplomat, one who had spent his life working outside his own nation with those whom his king needed a trusted advisor near. He wore a white collared shirt, blue wool trousers and a blue tailcoat with two rows of golden buttons. Unlike most ambassadors, he wore only the signet ring that came with his office and a thin chain that hung loosely around his neck. He was a quiet man that chose his words carefully. He was more than twice Eadric’s age; sixty-five if Eadric’s memory served him. Lord Biton Savakis, ambassador to Istivan, was as close to opposite of Wyne as could be. He was a huge man, one of the largest Istivani that Eadric had ever seen, with arms like trees. His skin was a medium olive, his hair dark and his green eyes sharp. He wore a brown leather vest and brown wool trousers. His massive arms were heavily tattooed. Eadric could see the tattoos that marked him as a husband and father, a warrior that had spilled the blood of an enemy, and one that Eadric thought meant that the man had stood as a judge before the King of Istivan. He was as loud and boisterous as Thomas was quiet and reserved. Nearing forty, he was only a few years older than Eadric, but he had garnered enough power in his homeland to earn his role as ambassador to Ansgar. The two ambassadors had insisted that they meet in private, and at their request Eadric had left his closest advisors in the antechamber. Now he wished that his advisors had heard everything the two ambassadors had said. And what they had asked for. “You realize what you’re asking for?” These were Eadric’s first words since his second glass of whiskey. Thomas spoke first, as was his place as the senior ambassador. “We do realize that it would require a great investment on your part, and on the part of your people.” His baritone voice was thick with the drawl of his homeland. “And the Citadel is a massive fortress. If Mercer can hold The Pinch with just his forces, all the better for us to not have to throw our armies into the fray. And if he falls, he will take enough of his enemy with him that we’ll have much less trouble cleaning up the mess. If you join with us,” Thomas added. “I’d like to bring my council in on this before I decide.” Eadric paused when his steward opened the door a crack and slid back into the parlor with a bottle of whiskey and a glass of ice on a tray. He took Eadric’s empty glass and slid back out into the hall. Eadric quietly sprinkled a pinch of Dragonsalt into the bottle and poured some over the ice. The two ambassadors bowed and Eadric nodded a dismissal. Eadric set his glass down on the star that marked Aetheston’s location on Zaria’s northern continent. More than thirteen thousand miles separated Ansgar from the Istivani capital of Kirton, if one sailed through the Strait of Steimor and marched overland; another eight thousand overland laid between Kirton and the Ehtroyan fortress known as The Citadel. Even by rail it would take his armies nearly a month to reach the Istivani capital. The option of sailing his armies to Ehtroy was an alternative, although that too would take almost a month of sailing, and finding the ships to carry almost two hundred thousand soldiers would be nearly impossible. Studying the lands he ruled, Eadric took note of the various sigils that marked the holdings of his many lords; the shields that marked the holdings of his dukes were the largest. The sigil of House Jarmann at Agilard, the only duchy east of Aetheston; the black Pegasus against white of House Chalmer in the West Valley, the castle nestled into the Spine Mountains against the border with Beldane; the blue hydra against orange of House Seward at Sea Watch, on the southwestern coast of Ansgar; the red centaur on a blue field of House Ridley in White Ridge, nestled between the Vast Sea on its south side and the three peaks of the White Ridge on its north. The golden hammer on gray of House Croutcher was last; despite its grand size, in the far western corner of the nation the Arndell Duchy was sparsely populated. Smaller shields marked the eleven earls of Ansgar, two east of Aetheston and nine to the west. Shields smaller still marked the forty-two baronies that divided the rest of the nation. He was not as familiar with the baronies as he was with the earldoms and duchies, but then he rarely had the occasion to deal with many of them. He had, of course, met every one of his sworn nobles at his coronation, or their ascension, but the lesser nobles had smaller estates to care for and could scarcely afford frequent journeys to the capital to pay homage to their king. “Your Grace.” Lord Alden Hanley, Earl of Hamilton, was a tall, slender man who leaned heavily on an ebony cane as he walked. Gray colored his brown hair and full beard, but his brown eyes were still sharp and careful. He wore a white shirt, brown trousers and a blue tailcoat with the symbol of his house sewn over his heart. “Lord Hanley.” Eadric clasped the man’s hands and inclined his head to his father by law. “Your Grace, you are looking well today,” Lord William Richards said as he bowed. Baron Saxan had long been one of Eadric’s closest advisors. He had been brought to court at the age of five by his father to learn the ways of the capital and the court of the nation’s ruler. William and Eadric had been tutored by the same teachers, taught of swords by the same master at arms, and had ascended to their titles at nearly the same time. Eadric had raised him to Lord Councilor as one of his first acts. He stood nearly the same height as Eadric, with a similarly athletic build. He was shaved bald, the thin mustache and well-kept red beard the only hint of his hair color. He wore a pair of simple glasses over his crystal blue eyes and blue tailcoat with a double row of golden buttons. “Thank you, William.” Eadric presented his signet ring for his friend to kiss. “My King, I see that the sums you have been spending on Dragonsalt have not been in vain,” Lord Peter Wellstone said with a smile. As the Chancellor of Ansgar it was his responsibility to keep the kingdom’s books and accounts. He was the youngest man in the room, only just into his twenty-fifth year, and wore the black tailcoat and trousers of the style popular with the Court as of late. He had been an apprentice to the last Chancellor, his childless uncle the previous Earl Colby, and had taken to his studies with fervor. He carried a stack of ledgers with him, books filled with figures on the kingdom’s incomes, expenses and coffers. He was a small man, not very assuming at first glance, with well-combed black hair. His blue eyes glanced back and forth every so often as if of their own volition. “Your Grace,” said a lilting, sweet voice. Altavius Dohr’s accent was less pronounced than it had once been, or so Eadric was told, but it still marked him as one not native to Ansgar’s common tongue. Altavius had served as advisor to every king since Liam the First King. Hundreds of years ago, one of Eadric’s ancestors had tried to grant him a small estate on the ocean shore in the Elsdon Duchy, but the Elf was a High Priest in some Elvish order, and they were not allowed to hold lands. Altavius’ eyes had once been a deep sapphire; they were now a pale blue. His once brilliant red hair was now silver and white and was tucked behind his long, tapered ears. Once he stood over a foot taller than anyone in the room; now he was hunched with age and leaned heavily on his staff. The apple sized emerald held in the staff’s heavy iron setting pulsed gently. He wore the brilliant green robes of an Elfish priest. Half a dozen heavy amulets hung on golden chains and jeweled rings sat on each finger. Eadric’s four advisors sat in the leather chairs. Each took a moment to adjust to the thick cushions in their own fashion. Lord Wellstone rested his stack of ledgers on the small table beside him. Altavius leaned his staff against the chair’s arm. Lord Hanley hooked his cane on the back of the chair, and Lord Richards pushed back into his chair and stretched his legs out before him. “Would you care for refreshments, my lords?” Eadric’s steward asked with a low bow. “A flagon of chilled wine,” Eadric said before any of his council members could make a request. “Yes, Your Grace.” The steward bowed again and disappeared through the door. The nobles made small talk with their king while they waited for the steward to return. He was only a few minutes in retrieving the chilled flagon, four silver cups and one griffin talon horn. He poured each a cup and retreated against the wall. Eadric set his cup untouched on one of the side tables. Altavius’ eyes glittered and William sat up in his chair. “He has refused to allow them passage?” William shook his head. “And they have told him that when the Emperor does invade, they will lend him no aid,” Eadric added. “You are correct.” Eadric nodded and took a drink. “The Grand Duke of Istivan and the King of Welos have asked that we call our levies to arms, sail them across the Straits of Steimor and march them overland to join with their armies in preparation for the invasion by Chesia. Their message comes with the endorsement of the Triumvirate of Lot’Mai-ron and the Sea King of Laine.” Altavius took in a great gasp of air. His eyes widened and his knuckles whitened, so firm was his grip on the arms of the chair. The two nations of Elves held wildly different opinions of the men that they shared this world with. The Sea Nation of Laine was a great naval power with swift warships and deep hulled merchant ships. They took part in the wars of men more often than their southern kin would have approved. Lot’Mai-Ron’s three-headed council held its nation out of the struggles of men. They provided wisdom and knowledge to those who asked it of them, but nothing more. And they rarely agreed with their estranged relations. “If we’re going to throw our lot in with Istivan and Welos, we need to make sure that we are not wasting whatever we send across the sea. Those men are going to have to return and till our fields. We need to send an overwhelming force,” Lord Richards pointed out, as if everyone in the room didn’t already know that. Peter’s ledgers were always impossibly accurate, so if he said that the royal coffers could withstand a cost, then it was true. Eadric had audited the accounts, more than once, and every time the numbers had come up correct. He wondered, as he watched the man flip through the pages of one thick leather tome, how it was that someone so honest had come to become a master of accounts. And what the man was hiding behind his obvious facade. “Yes, Your Grace.” Peter nodded and jotted this down in one of his ledgers. Altavius winced at the reference to the High Priest of Elsdon. The Elven priests did not get along well with the priests of the various gods that were worshiped in the lands of men. The High Priest of Elsdon led the largest temple in Ansgar, dedicated to Tyro, the Ansgari God of Justice. The Elsdon sigil had been taken from the symbol of the faith of Tyro: a giant with a spear in hand. “You are dismissed, gentlemen,” Eadric said. “Yes, Your Grace.” Alden Hanley and his colleagues bowed, and the three advisors excused themselves from the chamber. Eadric stepped back to the table he had been studying before his advisors had joined him. He had heard reports from his spy masters that the nobles of Western Ansgar had grown increasingly bold in their expression of discontent with his rule. Most were wise enough to have kept their feelings to themselves, or to express them only in private council. A handful, however, had railed against his policies in public meetings. Their representatives in the castle had downplayed their lords’ indiscretions; one had claimed that his lord was one of Eadric’s staunchest supporters among the nobles in the West. This would be an opportunity to send some of those malcontents away to see what it was like away from their warm castles and servants. It would do them well to get their hands dirty. Sending his armies across that sea was a risky maneuver. If he were attacked by any of his neighbors while his armies were away, it could take months to get his armies back. But it wasn’t his neighbors that he was worried about, and he was afraid to admit that to his advisors. “William, I’d like you to meet with the Welosi and Istivani ambassadors and inform them of our decision,” Eadric said. “Of course, Eadric,” William said with a nod. “Our armies will have months to train before they cross the Straits,” William said. “There are plenty of generals with more experience than me,” William pointed out. “Let me think about it,” William said. He stood. The nobles that once called themselves the nation of Kerberos had never been fully trusted in the halls of Aetheston and Founder’s Castle. They had fallen under the control of Ansgar after William the Defender had repulsed their invasion and countered with his own. When Sigurd Jarmann had knelt before William, he had pledged that his lands and those of his nobles would forever swear allegiance to the crown of Ansgar. Eadric doubted their resolve. He had no firm proof of their plotting, but he had heard whispers from his lesser advisors that those nobles were planning something, something that would put them back in control of their own lands. Alone they were not a threat, but their long-standing relationships with the neighboring nations, nations that shared a common ancestry, were a danger. They were not of the same blood as the people of Ansgar, who had come across the Vast Sea more than twelve centuries ago. If the Lords of Kerberos were able to convince King Penn of Steimor or Herzog Renwyk of Beldane to join their cause, they could field an army larger than any that Eadric could hope to muster. The soldiers that would sail across the sea would include the levies sworn by Kerberos and, if after the armies returned to their lands the Lords of Kerberos decided to press their independence, Eadric would have a favor owed by the Kings of Welos and Istivan that would give him additional forces. 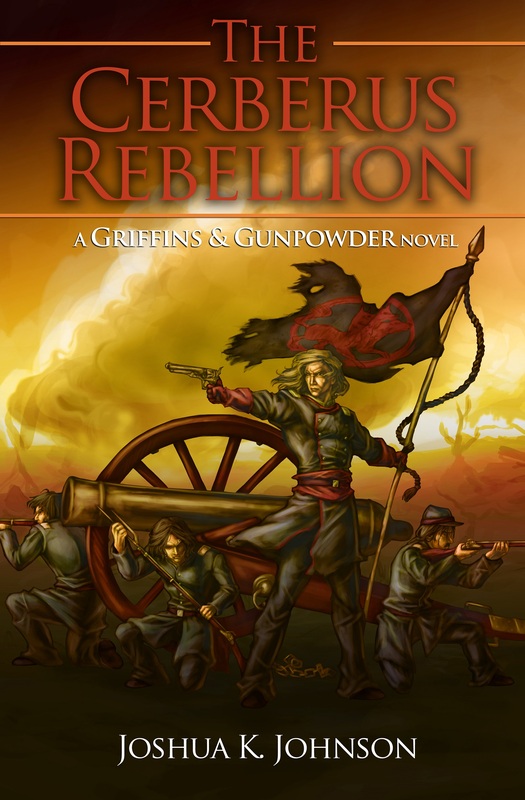 Posted on July 1, 2012, in Uncategorized and tagged Blurb, cerberus rebellion, griffins & gunpowder, Gunpowder Fantasy, writing. Bookmark the permalink. 1 Comment.